Plok meets an old friend from the SNES game, learns that he didn't get the sequel he expected, and sets out to find out why. 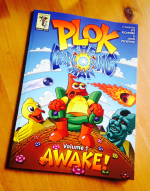 The first Plok comic strip edition collects episodes 1 to 26 of the webcomic and includes many exclusive extras. » View all 26 episodes of Volume 1 as a single long webpage. All 26 episodes of Volume 1 are available to read - for free! - right here. Plok awakes after a 20 year sleep. Plok comes to a realisation. Plok meets up with an old friend. A strange meteorite crash lands. Plok gets angry about a perceived injustice. Plok learns some infuriating news. Plok decides to get to the end of the level. A visitor from space inspects the meteorite crater. Plok finds that he's not in the game he thought he was. Plok is introduced to a new area by a new character. The Queen is revealed in her new nest. Plok discovers a new game. Plok remembers that all underwater sections are rubbish. Zob lands at Plok's house and inspects the flag. Plok and Wubba hop along towards Plok's house. Plok and Wubba stop for a rest and discuss the future. The birth of a swarm. Plok suggests some possible new game ideas. The swarm launch an attack, and an eye opens. 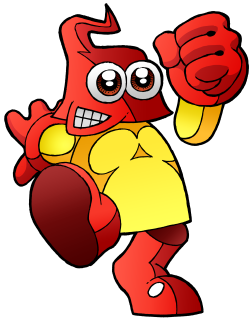 Rockyfella introduces Plok to a new gaming platform. Rockyfella explains that Nintendo don't make iPads. Zob rips down Plok's precious flag, then enters his house. Plok learns that he can't use touch-screens while wearing gloves. The swarm move on, leaving Xbone without any friends. The Queen begins to dream. In a fight with Plok's house, there's only one winner.